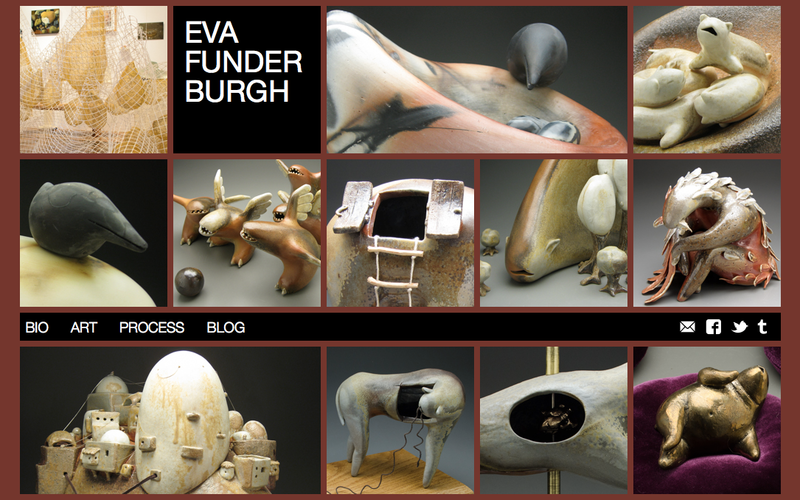 My wife Eva Funderburgh (Hollis) is a professional artist, and has been making sculptures full-time since we both moved to Seattle in 2005. 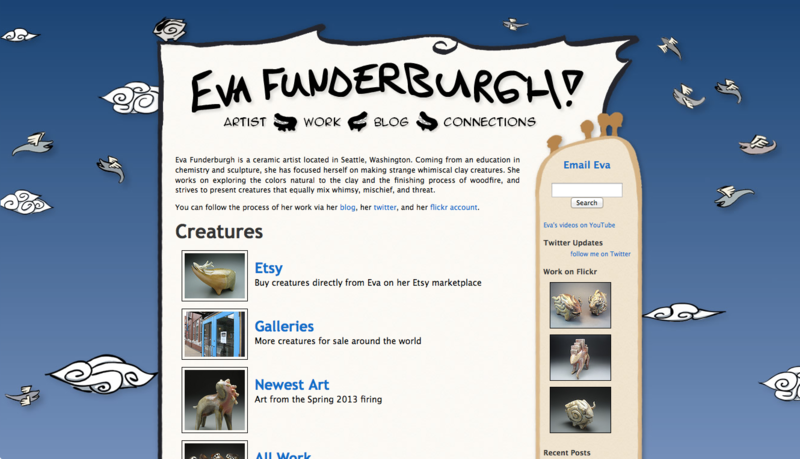 I don’t have much talent for clay, so my main contribution is to help with her website. A few weeks ago we launched the third iteration of her site, which we’d been working on for several months. The previous version (shown above) was launched around 2008 and was basically just a Wordpress theme. Eva had hand-drawn some creatures and wiggly borders to make it all feel less digital, but there’s only so far you could go with that on a web page. The resulting site had a lot of character, but ultimately failed to put her gorgeous art front and center. Worse, it had failed to keep up with the increasing sophistication and complexity of her work. It also scaled poorly to mobile devices, and just plain looked outdated. The other part of the homepage is the “lightbox” that appears when each tile is tapped. This is built from scratch rather than using any lightbox plugin, and uses CSS transitions to display smoothly. 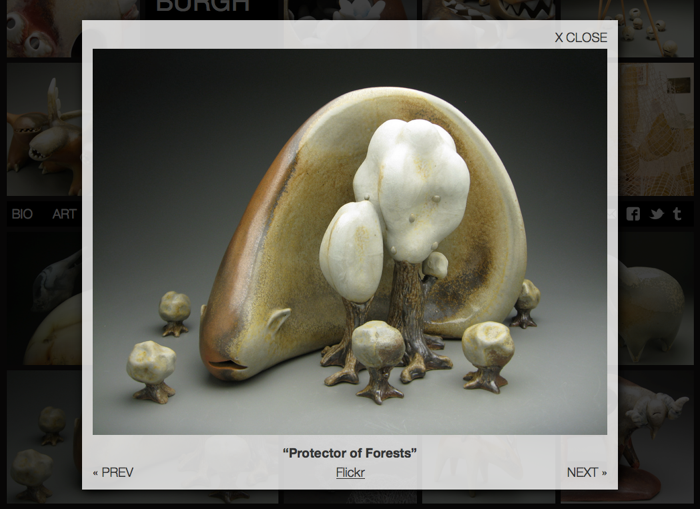 It also allows for keyboard navigation, so you can use the arrow keys to browse through pictures. The full-size image for the lightbox is linked directly from Flickr, and I use the Flickr API to select the perfect image size that won’t stretch and blur, but won’t waste time with a too-large download. This can end up showing a dramatically different sized image between a phone and a Retina Macbook! After the homepage, the rest of the site was relatively easy. For the most part, it’s still a Wordpress theme, though it reuses the responsive breakpoints at each integer multiple of the block size to provide nice reading on every screen. I also reused the exact same code from the homepage to provide a row of random tiles at the top of the page. Beyond that, there are just some SVG icons for the social media links (to ensure that they too display nicely on retina screens) and a few more subtle fit-and-polish tweaks to make it feel great. 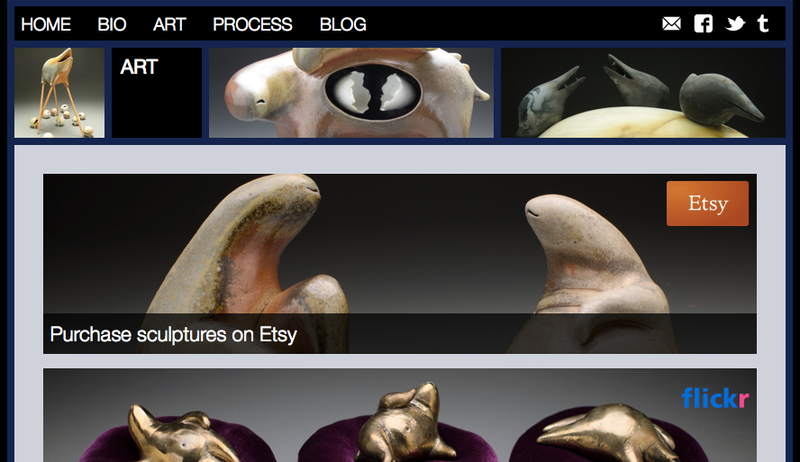 The “Art” page was designed by hand to provide high-resolution banners linking to Flickr, Etsy, and the various galleries that showcase Eva’s work, and the rest is editable directly from Wordpress so that Eva can maintain and update the content. A series of IFTTT rules make it easier for her to update the site while she’s working by piping specially-tagged Flickr uploads into the blog (and to Tumblr, Facebook, and Twitter). I’m rarely satisfied with the website designs I produce, but this time I’m extremely proud of what we’ve built. 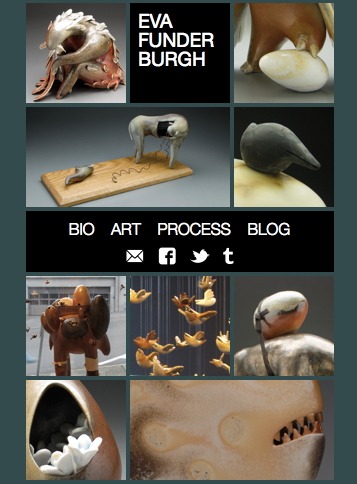 Please check out the site, resize your browser, try it out on your phone, but most of all, enjoy the pretty pictures.